Patrick Henry Hughes was a talented musician who always wanted to be a part of something bigger than himself. He dreamed of one day joining the University of Louisville marching band but there were two problems: Patrick Henry was born without eyes or the ability to walk. This is the inspiring true story of sacrifice, perseverance and realizing one’s potential. 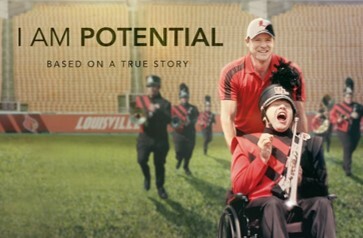 To view the trailer for “I Am Potential”visit: www.imdb.com/title/tt2918608/. The evening begins at 6:00 PM. This movie is a joint ministry event of the Special Needs Youth Ministry and the Respect Life Ministry. Dinner catered by Ippolito’s Restaurant. Register online at http://bit.ly/SB-RespectLife, ASAP. For info please contact Cathy Schneider at respectlife.saintbrigid@gmail.com.